This week’s mystery movie was the 1943 Monogram Pictures film “Blazing Guns,” starring Ken Maynard and Hoot Gibson, with LeRoy Mason, Emmett Lynn, Weldon Heyburn, Roy Brent, Eddie Gribbon, Lloyd Ingraham, Geo. Kamel, Kay Forrester, Robbie Kavanaugh, Frank Ellis, Charles King, Ken Duncan, Dan White, Chas. Murray Jr. Robert Allen and John Bridges. It was written by Frances Kavanaugh, and produced and directed by Robert Tansey. Sorry, buckaroos, “Blazing Guns” is not generally available on DVD, but you may be able to find a VHS version on EBay. I recorded it when TCM aired a series of Ken Maynard-Hoot Gibson “Trailblazer” movies in 2014. For Monday, we have this mystery chap. For Tuesday, we have two mystery guests. This is Roy Brent and Kay Forrester. Please congratulate Howard Mandelbaum, Mike Hawks and Don Danard for identifying Monday’s mystery gent. Yesterday’s mystery guests stumped the Brain Trust. This is Kay Forrester, Charles King (third from left) and Weldon Heyburn, center. For Wednesday, we have some mystery hombres. And for Thursday, we have a couple of mystery guests who are up to no good. This is LeRoy Mason, left, and John Bridges. And as an extra hint, here’s a fellow you may recall from a mystery Western we had last year. And for Friday, we have our mystery heroes. Hoot and Ken. I love those big hats. Please congratulate Mike Hawks (mystery movie and Thursday’s mystery desperado and mystery governor) and Don Danard (Thursday’s mystery desperado). And Ken Maynard gets some help from his horse, Tarzan. I’m guessing Monday’s guest is Eddie Waller. I think Monday’s mystery chap might be Si Jenks. Very familiar. ( grew up on Saturday westerns.) Is this Al St. John, aka “Fuzzy”? Alas, no. But you have the right genre. Alas no, but this has been a trip through Western sidekick-land. Today – don’t know the gal or the guy on the right but the three in the middle are Dan White, Charles King and Weldon Heyburn. I know Charles King is the man in black today and perhaps yesterdays man is Pierce Lyden. these guys made too many movies together. Wednesday’s mystery gal is a blonde Phyllis Coates, who starred in a lot of early 1950s westerns. Wild guess, Monday’s guest, Syd Saylor. I thought that might have been Weldon Heyburn wednesday. 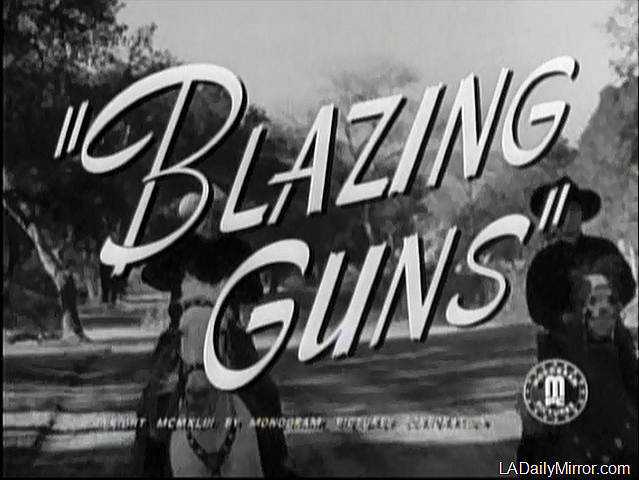 Now we have LeRoy Mason and Lloyd ingraham for BLAZING GUNS 1943. Thursday’s man with the pistol .. LeRoy Mason. Other guy ? Yes, with his famous “Letter From America.” Well, actually, I’m afraid not. Monday Arthur Hunnicutt, Wednesday John Russell, today Robert Barron on the left and Roy Barcroft as the older man. I wonder what Hoot Gibson and Ken Maynard are discussing. Hoot Gibson and Ken Maynard today. Guessing! Friday’s chaps are Hoot Gibson and Ken Maynard in BLAZING GUNS .